During a field survey on 10/2/2011, land snail enthusiast Brian Marshall discovered a population of Daedalochila auriculata along a hiking trail in a forested area north of Durbin Creek on the Julington-Durbin Peninsula in southern Jacksonville, Duval County, Florida. During his survey Brian found a total of seven specimens - two of which were alive. The surveyed site is southwest of the intersection of Bartram Park Boulevard and Pavilion Drive just south of Old St. Augustine Road and north of Racetrack Road and the St. Johns County line. This reporter visited the site on 10/5/2011, and after a lot of searching, managed to locate three additional empty shells along the trail (GPS: 30.07173N 081.32466W - WGS-84 Datum). An additional visit was made to the site almost six years later on 2/27/2017 and a single live Daedalochila auriculata was found under a decomposing log (see page two). Pictured below is the hiking trail which ultimately dead ends at Durbin Creek. 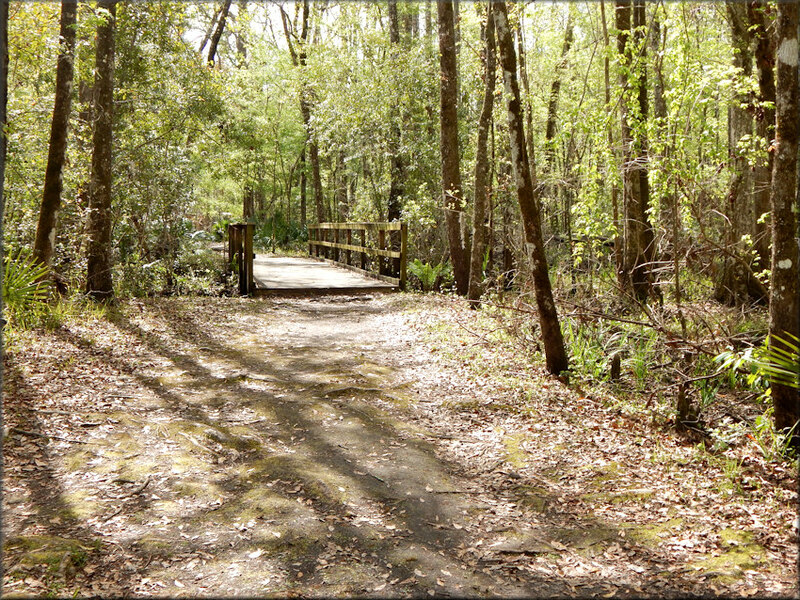 On both sides of the trail is the Durbin Creek flood plain.